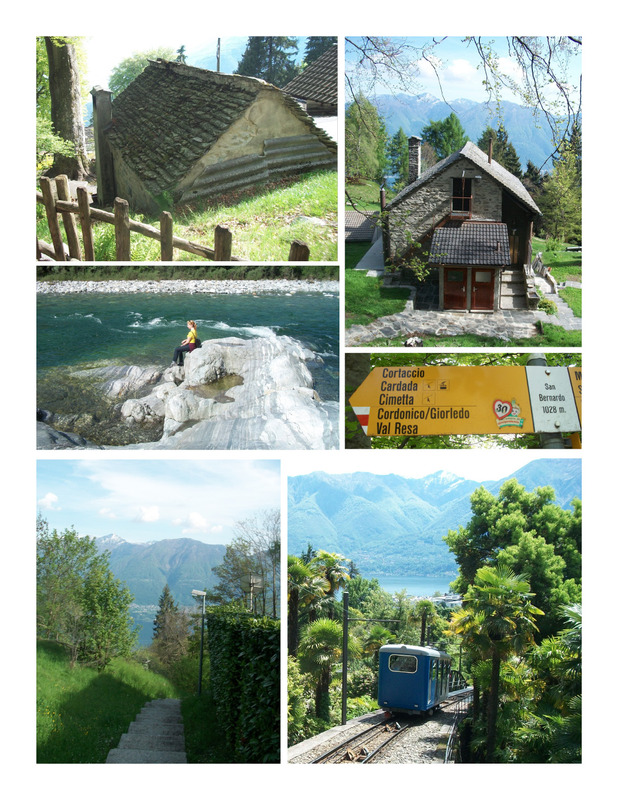 Locarno is in the Italian part of Switzerland, a four-hour train ride from Basel. On the way there, we sat next to a little Swiss German couple in their seventies. About 8 seconds after the train pulled out of the station in Basel, the woman started commenting on the landscape. “Beautiful! Amazing! Fantastic!” (in German, of course; Sarah translated for me). Basel is a nice city and the countryside is nice enough, but we were about 90 minutes away from the really pretty stuff when she started rhapsodizing. We channeled her through the whole excursion, though, crying “amazing! perfection! beautiful!” whenever we felt particularly moved. And then we sweated our way up the mountain, like bosses. The trail system really is amazing, though. We took the funicular (cause seriously, who can resist a funicular?) for the first leg of the journey, and then we just followed the yellow signs to San Bernardo, a destination 2 hours away (amazing: they said it would take two hours, and it did.) We walked with no real sign that we were getting close, and then, out of nowhere, we were in a town (and in fact, walking across people’s back gardens) while cuckoos sang from nearby trees. St. Bernardo was the first in a series of beautiful mountain villages with staircases running through them, the occasional jerry-rigged home-built funicular, and honest-to-goodness stone roofs. SO. INCREDIBLY. COOL. From there we went to Cardada, where we took in the view, and then we headed back down the mountain on the western edge. All in all we hiked for about 8 hours, stumbling onto the Piazza Grande just as dusk was settling in. We got bread and cheese and ate it, dirty and smelly and disreputable looking, on a bench while meticulously dressed people spilled out of an art opening next to us. The next day we didn’t quite recapture the magic, but we did find our way to the river, which was breathtaking, and to Ascona, another town about 4 miles away with a beautiful little high street and harbour. And then we took the train back to Basel (“amazing! Wonderful! too pretty!”) and joined Annie, our host, at an impromptu street party on the river before Sarah caught a 6 am flight to Amsterdam. Is ‘funicular’ British English for what I would call an incline railway?